Now you don’t need me to give you a Health & Safety lecture. Clearly the thing you throw into the sky should be something you’re prepared to have land on your head. So no pianos, anvils, irons, elephants, small churches and so on. At the same time feathers, balloons, bits of fluff, that foamy stuff on the beach and so on are a cop out. So here we are in the summer of 2010, early August, and the 2010 barge gang (Splogs, Sazbo, Dodge City, Bendy Ben, Tom Tom, Teblis & Conky Jonks) have decided to swap a weekend barging up the Union Canal with a weekend on a campsite in Oxfordshire. 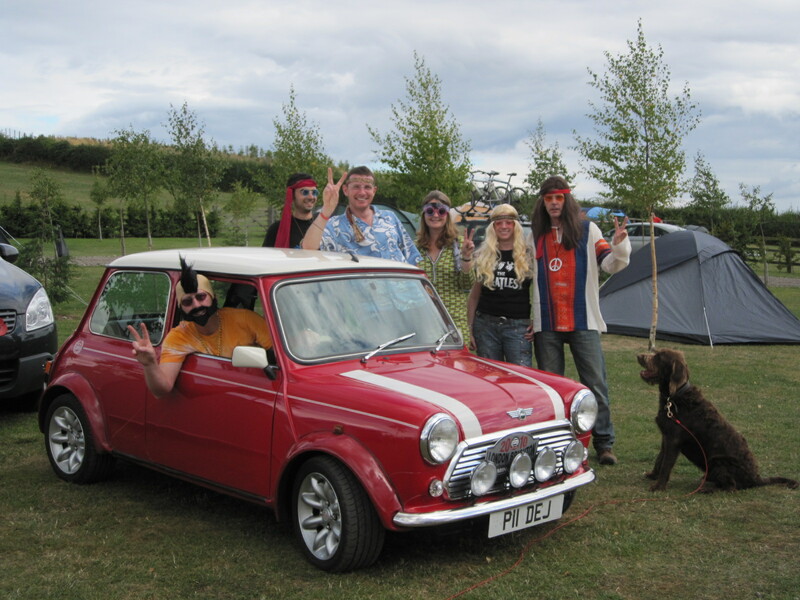 To coincide with this we celebrated two birthdays – Dodge City and Teblis – the theme was Hippy. Well the Bus was a good backdrop. It didn’t take long before the combination of alcohol and sitting round the lunchtime BBQ made the boys a wee bit restless. So off we went to play a game of ‘Throw-Ball’. Basically you get a tennis ball and throw it to each other. Yeah, I know, we’re rubbish at Game Naming, but in our defense most sports are a good description of the actual game. Like football, running, pole vault, arm wrestling and sword fighting. That said, there’s always an exception, like Curling, where the exact opposite is true. Please forgive me if you’re a Curling aficionado, but as far as I can tell, one thing a Curling stone can’t do is curl. They just go in a straight line don’t they? If you listen to Curling players on the tele you can hear them chuntering to the curling stone (which they think they are parents too) as it slides its way down the ice. “H’away ye go son… that’s it… keep straight son… keep straight .. keep straight…straight now… stay straight son… straight as ye go…. And his mates say, “Aye Tam, cannae believe that… does’nae make sense…… right where’s my stone… let’s get this baby curling…………………………………………………………………………………………………….. jeez man….. it’s dun it again….. what’s with this ice tonight??? You can imagine what the stone thinks of all this can’t you. I think they should rename it to “slide straight-stone”. Anyone for a game of ‘slide straight stone? Back to “Throw Ball”, despite it being a boys’ game Bendy Ben insisted on catching like a girl. But then he was wearing a girls’ blouse in his attempt to look like a hippy. Boys can play Throw-Ball for ages and ages, but eventually even this gets boring, so out came the bat and ball. One of those little bats with a fuzzy and a not-fuzzy side. The ickle tennis ball that came with the bats is furry so it sticks to the fuzzy side but bounces (not very well) off the not-fuzzy side. After a while we discarded with the bats and just threw the ickle ball, onto our heads. Chuck it higher will you, as high as you can? And that’s how BonceHeads came about. Ozzie Osbourne made a guest appearance – check the Bonceheads and Ozzie out here – Happy Hippy Glory Days. This entry was posted in The SapaBus Blog and tagged Barge Gang, Bonceheads, campervan refit, Camping, Glory Days, Ozzie Osbourne.